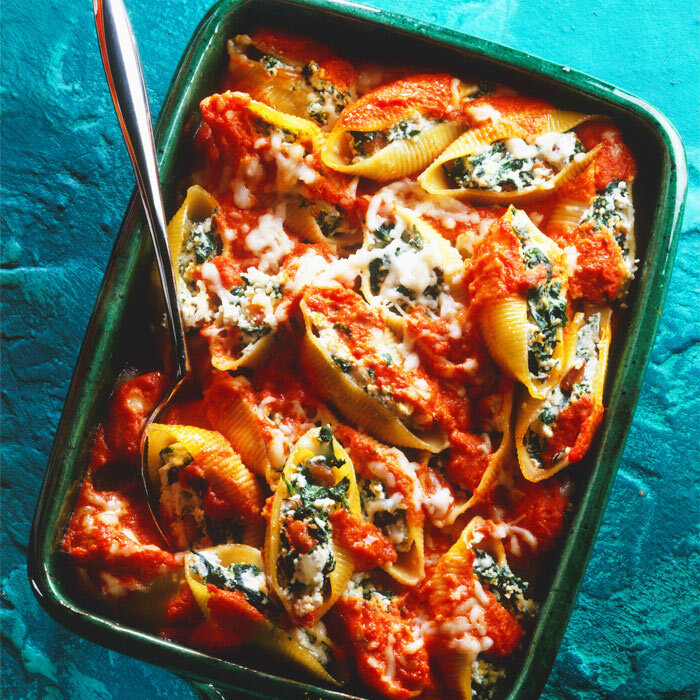 Better for you than classic baked ziti, this easy baked tomato pasta with spinach is an easy dinner that's just as comforting. Preheat oven to 350 F. In a large pot of boiling water, cook pasta according to package directions until al dente, about 12 minutes. Rinse penne under cold water and drain; set aside. Heat 1 tablespoon of the oil in a skillet over medium. Add garlic and stir until fragrant. Add spinach and 2 cups of tomato; cook for 4 minutes, until spinach wilts. In a medium bowl, combine remaining 1 cup of tomato, herbs, and salt. Transfer the cooked tomato mixture to the bowl and stir well. Add pasta to tomato mixture and combine thoroughly. Stir in 1/2 cup of the cheese. Grease bottom of baking dish with remaining 1 teaspoon oil. Pour tomato pasta mixture into dish. Bake uncovered for 15 minutes, then remove from oven and sprinkle with remaining 1/4 cup cheese. Bake until cheese melts, about 4 more minutes. Let stand for 5 minutes before serving.